One year before the 2013 General Elections, comes a by-election that might give an estimation of what will happen in the upcoming electoral fiesta. What the next days will bring is more than just a simple ballot casting. The Perfect Timing Only one year before the 2013 General Elections, comes a by-election on a silver plate. A perfect prova in the perfect time. Marwan Charbel has the chance to try his skills on a small-scale before the 2013 deadline. If he’s capable to control the electoral battle now, he’s likely to do so next year. If incidents break, he will have to review his plans. On Sunday the fifteenth of June, the Interior Minister has the chance to prove that he is as competent as Ziad Baroud (and maybe more), and that he is capable of smoothly running an election. The Strategic Place Koura is in the southern outskirts of Tripoli. The violence experienced in the city in the last couple of months might influence the voter’s choice. A fear of a Salafi rise can be used to recruit votes. Aoun noticed it, and plans on making use of the geographic location of Koura. “I question the claim the Syrian regime has arrived in Koura. Have they seen who stands at the edge of Koura? Has the LF candidate seen what is going on in Tripoli and Akkar?“. In a mainly LF dominated north, Koura is also very near to Zgharta, an 8 March-Frangieh stronghold which makes the electoral battle even more enthusiastic for the Northern Zuamas, Frangieh, Muawad and Geagea. 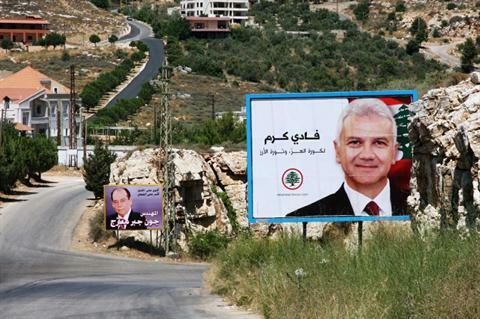 The Candidates And Their Affiliations Face to face stand two main candidates, both from Koura’s capital, Amioun. An SSNP one, Walid Azar and an LF one, Fadi Karam. The LF, more prepared, are fighting to keep the seat won in 2009 theirs, while the SSNP is trying to retake control and fill the breach. The LF, backed by the 14 March Alliance is more prepared while the SSNP recently nominated Walid Azar. Both LF and FPM are trying to show Koura’s Charles Malik as their mentor in a desperate way to get one more pinch of support for their nominee. The Regional Significance This is not only a Lebanese electoral battle. The battle might seem local, but it’s a lot more than that. The North was always in a way or another a mirror of what happens in Syria. The Syrian Internal Problems flashed in Tripoli as an armed conflict, and now appear in Koura in the form of an election. It will not count as a military battle, but it will sure be a moral win or loss that will have a significant echo in the Levant. The Sectarian Balance Koura is the only Caza in Lebanon where the Greek Orthodox population is a majority (65%). traditionally, they are a bit more close to the SSNP and FPM than to the LF. However this advantage for the SSNP candidate might be counterbalanced with the Maronite community (20%) that is more likely to go for the LF candidate. But the key to the seat remains the Sunnis in the caza. They count about 12%, but it is not clear if they will vote for the Candidate of a Christian sectarian party allied with the sunnis of March 14 Alliance or for a secular candidate with March 8 Alliance. That explains the Hariri visits. The Delicate Funding There has been talk that the LF’s campaign costed 2.5 Million $, and that the SSNP’s one costed 200K $. But what really matters isn’t how much you pay, but how can you maximize your success out of a limited budget. Next year’s elections won’t be that local, and the coalitions should focus on organizing their fundings or they’ll be under tons of bills. It’s true that the funding is probably from across the borders and might seem infinite, but no one likes to lose money, especially if you end up losing it with the elections. The financial errors occuring today on a local scale will be on the not to do-list of next year’s elections. Speculating about who will win is useless. Because no matter who will win on sunday, the parliamentary equilibrium will slightly change. But what will truly change after the results is how each concerned person and party will react in the 2013 elections. The importance of this by-elections is in seeing what the people wants now, in order to build speeches about it next year. It’s seeing what the people fear, in order to frighten them more or recomfort them, depending on the need. It’ seeing where the negative issues are to go prepared next year. Practice makes perfect. At least that’s what they say. My friend, Lebanese Forces are celebrating now their victory for all the reasons you just listed. But in my opinion this victory will not affect by any means the final results of 2013 (14 march popularity will be affected). Yeah, I just wrote another post on the Aftermath of it, you might also check it.